4th December 2011, the date of the Russian parliamentary election, was a difficult day for the system administrators of many liberal internet sites. 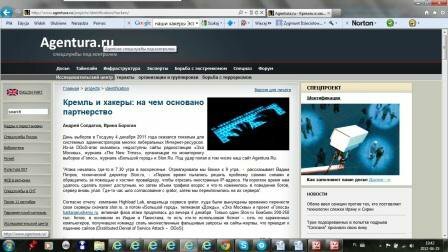 DDoS (distributed denial of service) attacks shut down access to the websites of the radio station ‘Ekho Moskvy’ [‘Echo of Moscow’], the ‘New Times’ and ‘Bolshoi Gorod’ [‘The Big City’] magazines, the election monitoring organisation ‘Golos’ and the business news and blogging site Slon.Ru. Our own site, ‘Agentura.Ru’, was also one of the sites attacked. After Slon.Ru, ‘Bolshoi Gorod’, the ‘Dozhd’ TV channel, ‘Ekho Moskvy’, and ‘Golos’ all switched to Qrator’s servers. According to the report by Highloadlab, owners of the service, the active attack phase continued into the evening of 4th December. Slon.Ru alone was bombarded by 200,000 to 250,000 bots, mostly from India and Pakistan. In other words, someone used a botnet, a network of ‘zombie’ computers, to send a high volume of fake requests to the targeted sites with the aim of producing a server overload, which would then cause the site to crash. By the next day, the active phase of most of the attacks was over, although in certain cases (that of ‘Ekho Moskvy’, for example) it switched to a ‘state of anticipation’: about 100 bots attempted to send ‘difficult’ requests to the server, to catch the moment when the site would start to fail and possibly emerge from its protected state. It looked as though everyone’s worst fears had been confirmed, that the Kremlin would be able to use the hacker community to organise attacks on independent media sites and the opposition, not to mention the web resources of countries considered unfriendly by Moscow. These fears seemed to have been well-founded. Hackers who had grown up in post-Soviet Russia had earned a reputation of being among the most active and dangerous cybercriminals in the world. At the same time Russian technical universities, the main suppliers of computer programmers, hackers included, had become a base for ‘patriotic’ minded young people. Many budding Russian IT specialists were angry with the changes of the 1990s, which brought with them, among other things, cutbacks in the defence industry – the main employer of the Soviet technical intelligentsia. It is also worth remembering that in the Cold War years Soviet intelligences agencies were on a more or less equal footing with the two most powerful centres of electronic intelligence gathering in the world, the USA’s National Security Agency (NSA) and the UK’s Government Communications Headquarters (GCHQ). In February 2002 students from Tomsk University conducted a cyber attack on the ‘Kavkaz-tsentr’ site, which supported the Chechen rebels, and the local FSB refused to prosecute them, calling the attack ‘an expression of a civil position that is worthy of respect’. In 2007 foreign government sites were subjected to attacks for the first time. Estonia had angered the Kremlin by removing the so-called Monument to the Liberators of Tallinn, which featured a bronze soldier in Red Army uniform, from the centre of the city. And on 27th April Russian hackers carried out a series of attacks on Estonian governmental, parliamentary, ministerial, newspaper and TV and radio sites. After Estonia came Lithuania. In 2008 this former Soviet republic antagonised the Kremlin when its parliament voted to ban the public display of both Nazi and Soviet symbols. This triggered an immediate massive cyber attack: on 30th June the Lithuanian telecommunications service reported an attack by hackers on 300 websites, where they had pasted Soviet red flags and anti-Lithuanian slogans. In August 2008, the war between Georgia and South Ossetia triggered a cyber attack on Georgia’s internet infrastructure. At the same time a number of groups appeared, among them ‘Civil Anti-terror’ (www.anticenter.org) and ‘Internet Underground Community vs. Terrorism’ (www.peace4peace.com), whose aim was to mobilise web users against sites that supported the Chechen rebels, and who suggested using DoS attacks to do this. In 2007 we noticed the National Anti-Terrorist Committee, whose chair is the head of the FSB, taking an interest in the patriotic hackers of ‘Civil Anti-terror’ and trying to contact them, seeing them as potential allies. The same year saw the emergence of a figure known as ‘Hacker Hell’ as the main scourge of liberals on the Russian Internet. A group of supporters attached themselves to him on the ‘Live Journal’ blog site, calling themselves sometimes ‘the Hell Brigade’, sometimes ‘the Hell Party’, and then settling on ‘the FSB Brigade for the Strangulation of Democracy’ (http://fsb-brigada.livejournal.com/ ). While most of his gang busied themselves with trolling on liberal sites, posting inflammatory messages to disrupt discussions, Hell was hacking into opposition leaders’ email accounts – most famously, those of Aleksey Navalny and his wife in October 2011. Among his other victims were the blogger Andrey Malgin, an exposer of corrupt officials, and ex-MP Viktor Alksnis, who led the campaign against the illegal sell-off of public land in the trendy residential Moscow district of Rublyovka. And in January 2012, when opposition hackers accessed the email account of the Nashi press officer Kristina Potupchik, it turned out that the Kremlin’s youth movement was planning a DDoS attack on the Kommersant newspaper’s website. The question has always been: is this campaign the work of ‘real’, expert hackers, or of activists mobilised by the Kremlin? The St Petersburg hacker SEVERA (whose real name is thought to be Pyotr Levashov) is one of the best known kings of spam, whose activities have earned him a place of honour on the database of Spamhaus, an international organisation that fights spam and phishing. He owes his great popularity to the clever fake antivirus programmes he disseminated to scale up his botnet, and which he then used to spread spam. He’s been known in computer circles since the end of the 90s, and many hackers suspect that the extent of his operations and incredible luck in his relations with the authorities can be put down to collaboration with the FSB. SEVERA’s attempts to publicise his antiterrorist initiatives on closed forums have linked his name firmly with the security services and alienated other hackers, who have been put off from taking part in these initiatives. Both ‘Civil Anti-terror’ and ‘Internet Underground Community vs. Terrorism’ are inactive at present. The number of politically inspired DDoS attacks, however, continues to rise, although when the hacker community is involved with them it is in an unexpected fashion. The St Petersburg hacker Andrei, username Sporaw, rose to fame in the early 2000s, when he gave comments on the hacking community in Russia for the BBC and the newspaper ‘Vedemosti’. Sporaw is very critical of the liberal opposition and western values: his website’s home page shows the state emblem of the USSR on a red background, with the caption ‘The country which does not exist’. At the TED (http://www.ted.com/pages/about) Global conference in Edinburgh in June 2011, Mikko Hypponen referred to Sporaw as a Russian hacker whom he recognised by his signature in the body of his ‘exploit’ (a programme that takes advantage of software vulnerability). This signature contained the number of Sporaw’s car, a black Mercedes S600, which Hypponen had learned from a photo of the car on the hacker’s ‘Live Journal’ page. And at the end of January 2012 the well known blogger Anton Nossik accused Sporaw of hacking into Aleksey Navalny’s email account (for which ‘Hacker Hell’ later admitted responsibility) and of working for Kremlin spin doctors, on the grounds that Sporaw argued for the authenticity of the intercepted Navalny’s emails. ‘There are two alternatives. One is people, loads of people. And most of them wouldn’t even need to be particularly technically competent - just a huge number of people with a few techies in amongst them. In general the attacks came from imageboard forums such as ‘4chan’, ‘2ch[annel]’ and the Russian analogue ‘2ch.so’. Their DDoS attacks were on the level of “download this script and send it every computer you can access – at home, at work.” And what you would then get was something primitive, like a site being subjected to constant bombardment by a ping flood (http://en.wikipedia.org/wiki/Ping). That’s what they did in Estonia and Georgia. To understand how dumb these hackers are, you need only look at the tool they use – the DDoS - LOIC (Low Orbit Ion Cannon). That means that people have access to a ‘handy programme’ that allows them to create DoS (denial of service) attacks (specifically DoS – not DDoS (distributed denial of service) attacks. The DDoS is dependent on the enormous number of people involved. ‘So what is the second alternative? ‘, we asked Sporaw. How many people does Sporaw think might be involved in this? Stanislav Shevchenko, who for 11 years was deputy head of KasperskyLab’s innovation department (he left the company in autumn 2011), agrees with most of Sporaw’s analysis. He believes that botnets are not created to order for political purposes, they are made for long term, repeated use, where DDoS attacks are just one option. So how many botnets does Shevchenko believe there are on the net – millions? At the peak of political hacking in 2011-2012, two types of cyber attack predominated - DDoS attacks and email hacking, and these were used by both pro-Kremlin cyber activists and the opposition. In response to hackers’ attacks on the emails of Navalny and of Grigory Melkonyanetz, one of the heads of ‘Golos’, opposition hackers broke into the email account of Kristina Potupchik, the press officer of ‘Nashi’. After the DDoS attacks on liberal media sites on the day of the parliamentary elections, the Central Election Committee sites ‘webvybory2012.ru’ and ‘cikrf.ru’ were attacked on the day of the presidential election. 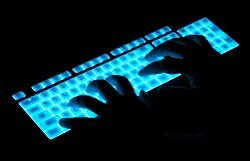 The ‘Anonymous’ movement has admitted responsibility for hacking the email of Kremlin youth movement functionaries in January 2012. Interestingly enough, the tactics used by this group’s Russian branch are very different from those used in other countries. In the West, ‘Anonymous’ attacks sites belonging to the CIA and the UK’s Home Office, but in Russia they didn’t try to hack into government or other official sites, but merely individuals’ email accounts. We asked Russian ‘Anonymous’ activists to explain this difference in tactics. We suggested that there seemed to be very few actual expert hackers involved in the political cyberspace battle in Russia, on either the Kremlin or the opposition sides, and that it appeared to be more like a battle between opposing political activists. Did they agree? ‘You’re right, there are not that many expert hackers. The Kremlin doesn’t need them because it has other means of extracting information (you remember when the head of ‘Golos’ had his notebook seized)? There’s no one the government needs hackers to attack – they don’t have any specific use for them. And we also don’t have any particular need for serious hacking at present or in the near future. Why do we need access to government sites and documents, when the most serious crimes are being committed by government officials in a pseudo-private capacity? So despite the increasing number of cyber attacks on the Russian political internet, the people behind them are usually activists, rather than professional hackers. For Russian cyber criminals hacking remains first and foremost a business: they will take political orders, but only on a commercial basis, and even then they prefer to work not for the security services, but for Kremlin youth organisations, since this work brings them huge profits without any risk of losing their anonymity.